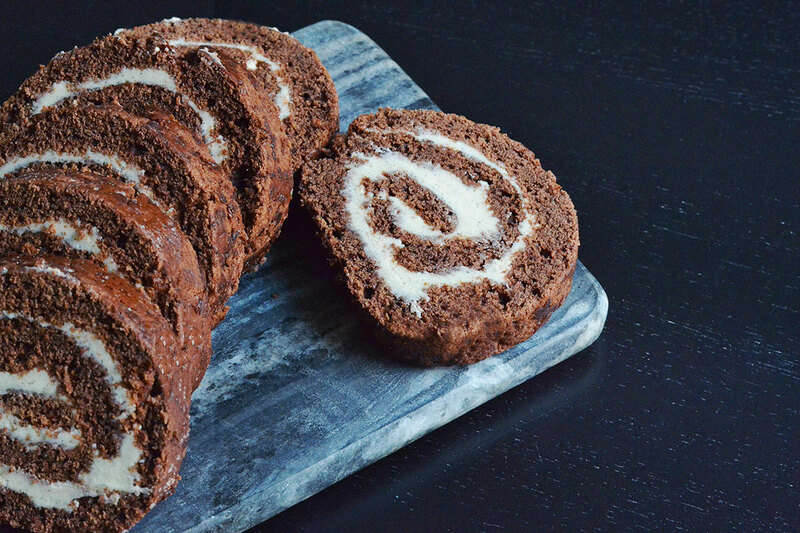 A brownie like cake topped with buttercream frosting and rolled into a log. Super simple, but sounds delicious doesn’t it? It is! 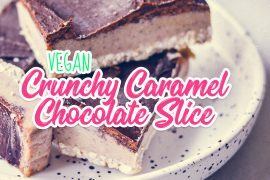 Here’s how to make vegan dream cake. 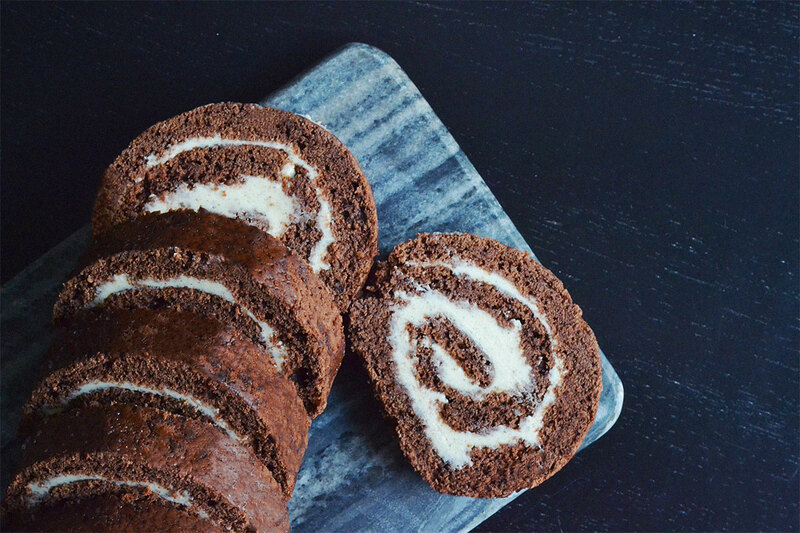 If I were to try to describe what it tastes like I’d say it’s like a brownie – though slightly less sweet – topped with buttercream frosting. And it should always, always be eaten chilled. Basically, it’s the kind of stuff dreams are made of. Yes, I did just go there. 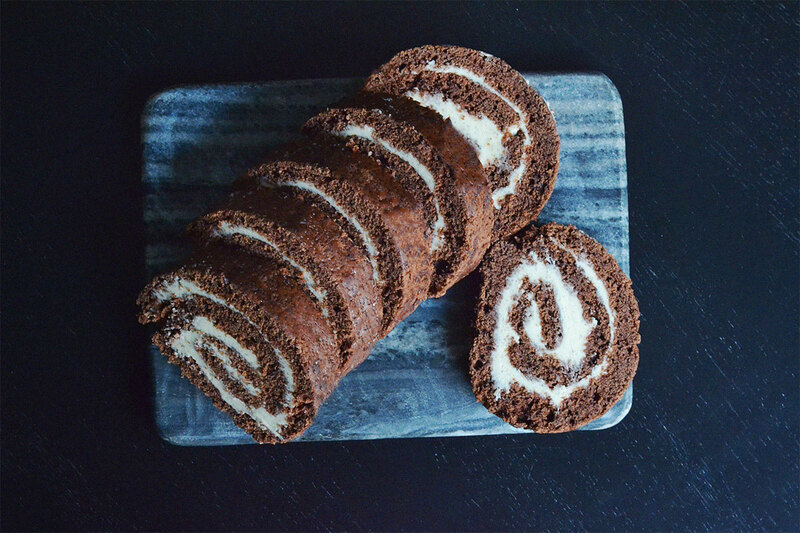 The original name for this cake is actually “Drömrulltårta”, which is Swedish and – directly translated – means “dream roll cake”. 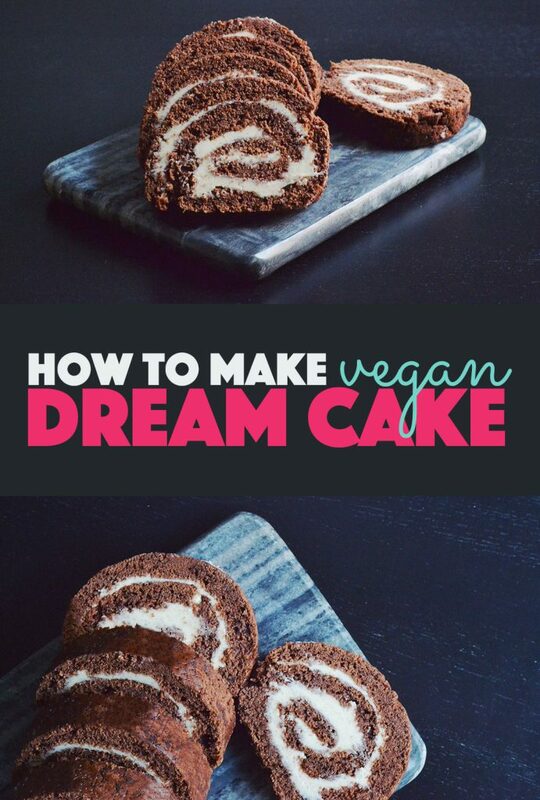 Or maybe someone made it, took a bite, and decided to call it dream cake. Whatever the origin of this cake, it is undoubtedly aptly named. This cake has been with me since my childhood and every once in a while I’m reminded of it and have to make it. 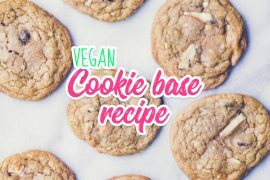 This time, I decided to try making a vegan version of it. Which was easier than I thought! In a separate and microwave proof bowl, melt the butter. Add the butter and dairy free milk to the dry ingredients and mix with an electric beater. Spread the batter evenly over the parchment paper on the baking tray, as thin as possible. Bake in the oven for 6 minutes, keep an eye on it so it doesn’t burn! Meanwhile, palace a piece of parchment paper on a clean surface and sprinkle som sugar on top. Take the cake out of the oven and immediately flip it over on to the sugared parchment paper. Then carefully peel the bottom piece of parchment paper off and allow to cool completely (tip: set the cake on a chilled baking tray to speed up the chilling process). Make the buttercream by mixing together all the ingredients with an electric beater. Once the cake has chilled, spread the buttercream evenly across the cake (make sure you spread it all the way out to the edges). 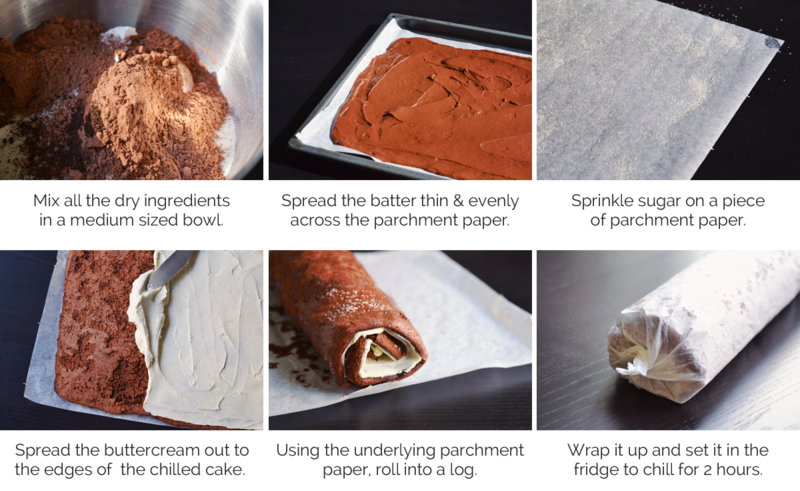 Use the underlying piece of parchment paper to help you carefully roll the cake into a log. Then wrap it up and set it in the fridge to chill for at least 2 hours. 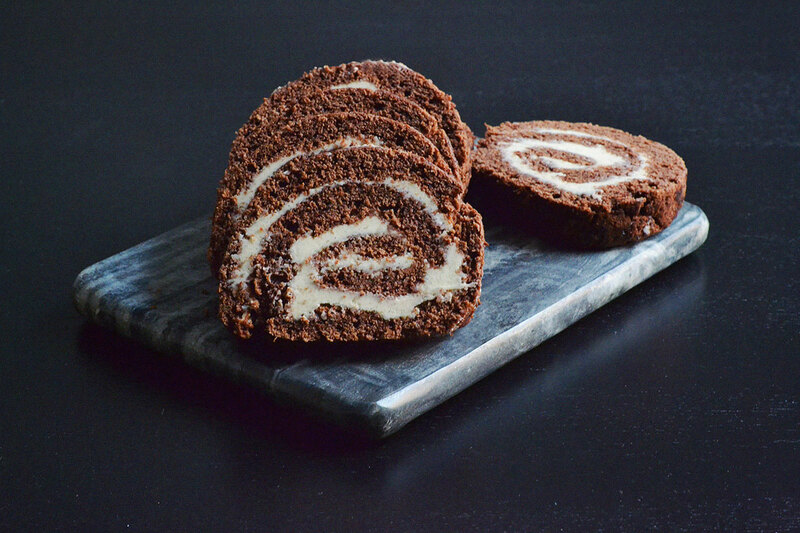 Cut into slices and enjoy! Keep it in the fridge and serve it chilled for best consistency and flavour. it blows me away that you can come up with these recipes …. not to mention the awesome pics that make it look so yummy. 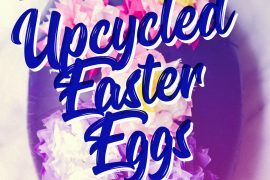 I never would have thought this recipe possible without eggs! Yeah, it’s one of my favorites too! Jättegod! Tack för att du delade med dig av receptet! Tack! Vad kul att du bakade den Ninni!